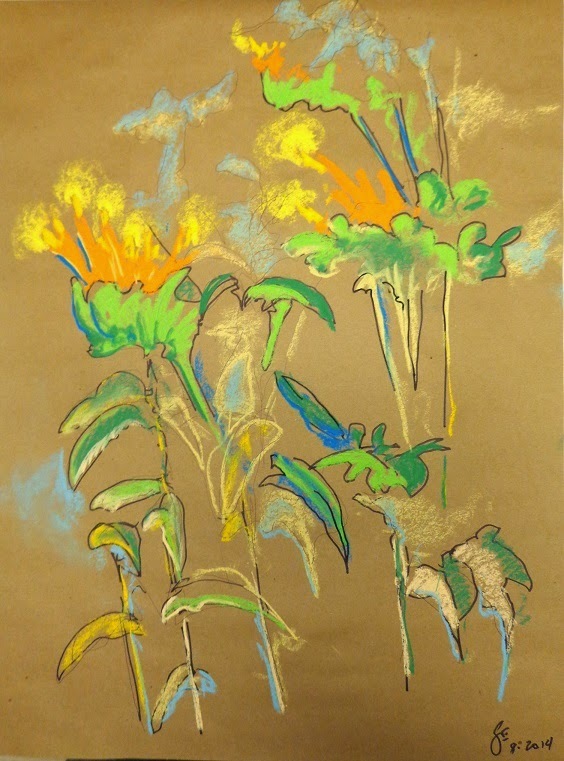 As an extension of the auto drawings and blind contours, and to continue my effort to cut out the hesitant, verbal (and second guessing) part of my mind, I began a series of pastel drawings on kraft paper. These are 18 x 24 inches, done with Sharpies and pastels. They are drawn in less than 15 minutes, so there isn't time to freeze up. They are done in the garage, because pastels are a mess. This first one was inspired by tithonia I could see in the flower bed closest to the open garage door. And some phlox. The flowers here don't follow tithonia - they look like more like the way tithonia makes me feel, like birthday candles on bright orange cupcakes. And to give you some idea of scale, our tithonia plants typically top seven feet tall. This drawing is way too tame, and too predictable - but it's a start. The second in the series is more to my purpose (but that's another post). I have no idea where I'm going to keep these drawings. Pastels are hard to store.